Chambers and Partners honored Morrison & Foerster as Japan International Law Firm of the Year at the 2017 Chambers Asia Pacific Awards for Excellence, held in Singapore on March 24. This marks the fifth year in a row that Morrison & Foerster has received this award and the sixth time in the seven years that the award has been presented. 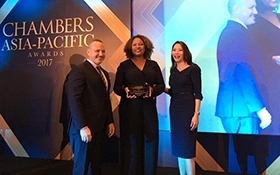 The Chambers Asia Pacific Awards recognize domestic and international law firms across the Asia-Pacific region for their pre-eminence and notable achievements over the past 12 months, including outstanding work, impressive strategic growth, and excellence in client service. With 120 attorneys resident in Tokyo, Morrison & Foerster has the largest presence and offers the broadest range of services of any international law firm in Japan. The Tokyo office recorded one of its strongest years to date, handling some of Japan’s most complex and important transactions and disputes of 2016. Contributing to the firm’s dominance in the Japanese M&A space is ongoing work on behalf of SoftBank on several strategic matters, including SoftBank’s $31.4 billion acquisition of ARM Holdings and the $8.6 billion sale of SoftBank’s stake in Supercell Oy. Morrison & Foerster is “the top firm for real estate in Japan,” according to Chambers Asia Pacific. Outbound real estate work has been on the rise in recent months. With the strongest real estate team in Japan — including two partners ranked as Star Individuals and two other partners ranked in Band 1 by Chambers Asia Pacific — Morrison & Foerster enjoyed more than its share of the expanded activity. Our litigation practice remains uniquely positioned, with particular success in 2016 for two respondents in an ITC investigation initiated by a non-practicing entity against two automobile industry clients (Fujitsu Ten and Honda, respondents in ITC Investigation No. 337 TA 984 “In re Certain Computing or Graphics Systems, Components Thereof, and Vehicles Containing Same”) and we are currently representing Toshiba and its suppliers in Lambeth v. Toshiba (hard disk drives). We have also represented Advantest, Buffalo, Fujitsu Limited, Fujitsu Semiconductor Limited, Idemitsu Kosan, Konica Minolta, Micron Memory Japan, Nippon ITF, Ricoh, Sega, Showa Denko, Socionext, TDK and other major corporations in various intellectual property disputes and adversarial patent license negotiations against some of the world’s largest patent holders and consumer products companies. In addition to these representations, our reputation for successfully helping Japanese IP owners monetize their patents earned us the honor of representing IP Bridge in its on-going litigation in Delaware to enforce its leading portfolio of wireless communications patents against TCL, a global handset maker.